Chronic alcohol consumption causes liver injury, inflammation and fibrosis, thereby increasing morbidity and mortality. Paradoxically, modest drinking is believed to confer metabolic improvement, but the underlying mechanism remains elusive. Here, we have identified a novel hepatoprotective brain/brown adipose tissue (BAT)/liver axis. Alcohol consumption or direct alcohol administration into the brain stimulated hypothalamic neural circuits and sympathetic nerves innervating BAT, and dramatically increased BAT uncoupling protein 1 (Ucp1) expression and activity in a BAT sympathetic nerve-dependent manner. BAT and beige fat oxidized fatty acids to fuel Ucp1-mediated thermogenesis, thereby inhibiting lipid trafficking into the liver. 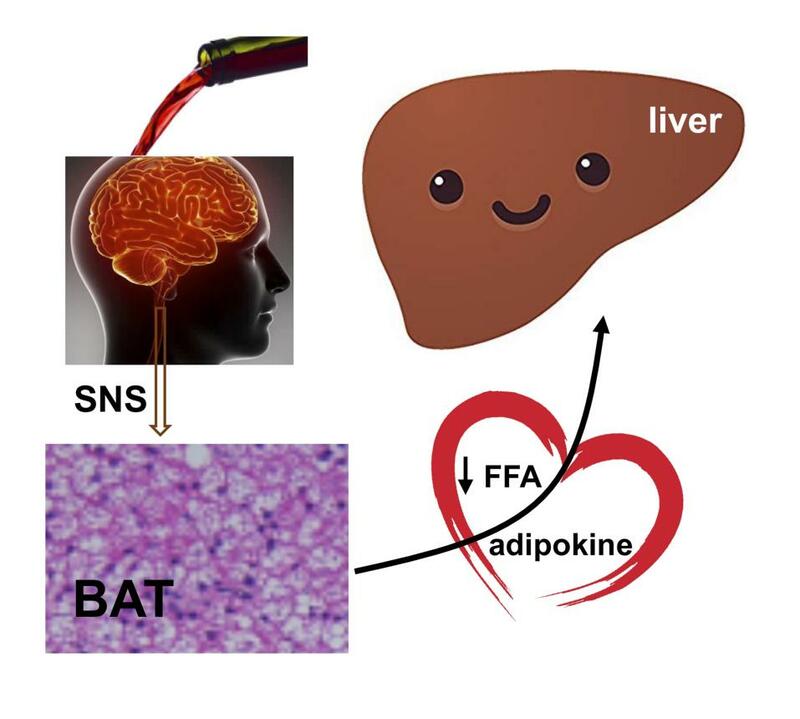 BAT also secreted several adipokines, including adiponectin that suppressed hepatocyte injury and death. Genetic deletion of Ucp1 profoundly augmented alcohol-induced liver steatosis, injury, inflammation and fibrosis in male and female mice. Conversely, activation of BAT and beige fat through cold exposure suppressed alcoholic liver disease development. Our results unravel an unrecognized brain alcohol-sensing/sympathetic nerve/BAT/liver axis that counteracts liver steatosis and injury.